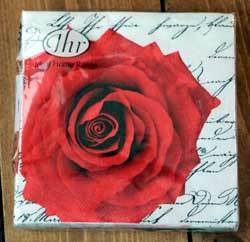 Hugs and Kisses Beverage Napkin, by Design Design. Printed with a variety of hearts in pinks and whites. Biodegradable, water-based inks printed on 3-ply tissue, bleached without chlorine. Made in Germany. Measures 5 x 5 inches. 20 per package. In LFeatures a red rose against a black background with white script. 3-ply, 20 per package. Features a red rose against a white background with black script. 3-ply, 20 per package. Measures 6.5 x 6.5 (folded). 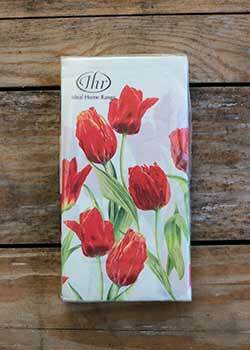 Features a beautiful reproduction artwork of red tulips. This is for the paper Guest Towel. 3-ply, 16 per package. 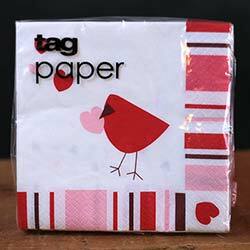 Love Bird Paper Cocktail Napkins, by Tag. Printed with water-based inks, 3 ply paper. 20 napkins per package. Measures 5 x 5 inches (folded). Features artwork by Curly Girl designs. Reads: "There are many things, I'm sure," she said, "without which we could not live...but love is the only one I can think of." 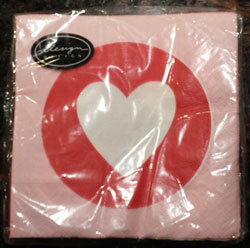 Mod Love Beverage Napkin, by Design Design. 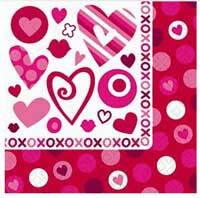 Printed with a mod design of simple heart and circles, in pinks and red and white. Biodegradable, water-based inks printed on 3-ply tissue, bleached without chlorine. Made in Germany. Measures 5 x 5 inches (folded). 20 per package. 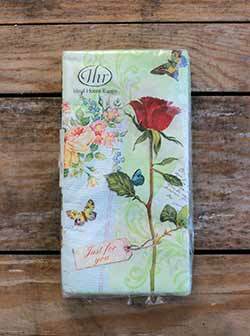 My Sweetheart Luncheon Napkin, by IHR, a division of Boston International. 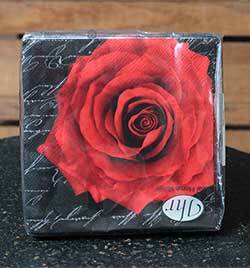 Features a single red rose against a collage background with a tag that reads "just for you." 3-ply, 20 per package. Measures 6.5 x 6.5 (folded). Printed in Germany, 100% recycled. 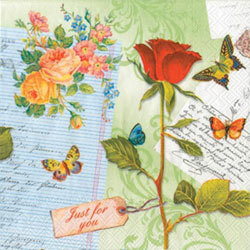 The My Sweetheart collection features a beautiful reproduction victorian images of butterflies, swirls, and red roses. This is for the paper Guest Towel.